The IFSS (International Federation of Sleddog Sports http://www.sleddogsport.net/ ) World Cup Triple Crown race was held at Darnaway in Morayshire, as the first of three events to be held as qualifiers in the UK for the 2014/2015 IFSS Championships. The Sled Dog Association of Scotland (SDAS http://sleddogassociationofscotland.wordpress.com/ ) hosted the event and it proved to be a fantastic start to the series with a good turn out in most classes, in spite of it being a long drive for anyone not based in the north of Scotland. A friend and I decided to lift share for this event and set off late Thursday evening with a stop off at Tebay (Westmorland Services) to break up the drive. 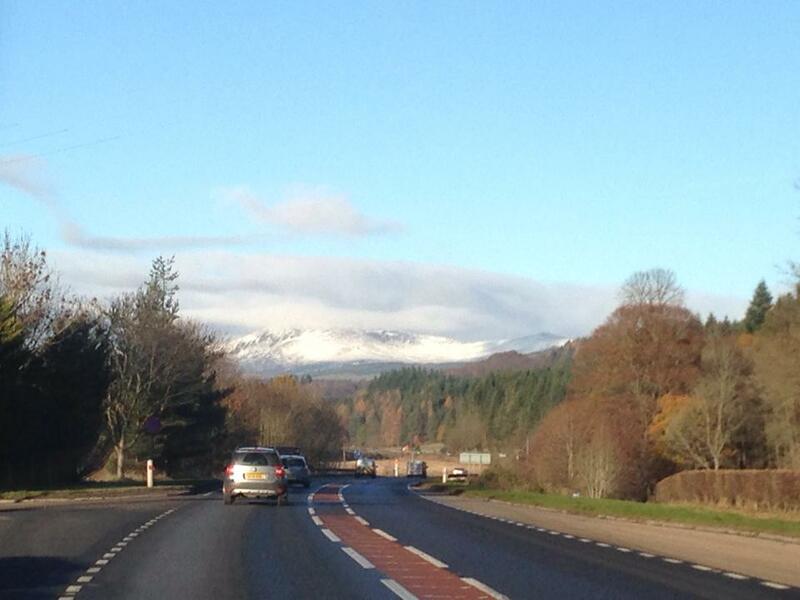 An early start on Friday to ensure we reached the venue in daylight was necessary and we continued our way up the motorway into Scotland and then on up into the Highlands. We arrived at the forest late Friday afternoon just as the light was going and managed to get set up before the dark took hold. I decided not to walk the course that night as I knew it would be well marked to cater for those running the 8 dog teams at speed, plus we were all tired after an 8 hour journey. Saturday morning we were up early for the mushers meet (race briefing) and to get our bibs which were provided courtesy of Buff who sponsored the event (as well as numerous others, including CSJ who we use for dog food). 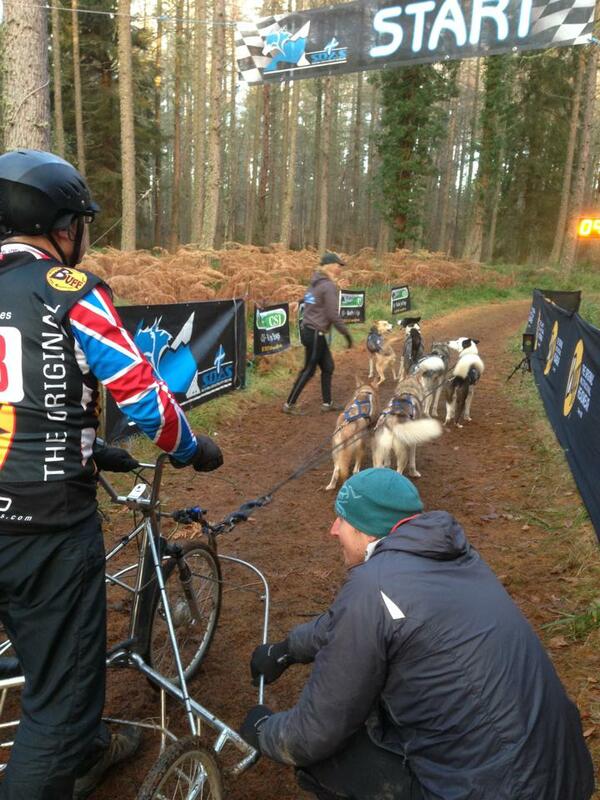 The mushers, bikejorers, scooterers and canicrossers were all required to attend this, as some of the different disciplines had slightly different routes which were changed between the classes. By the time it was our turn to race I had heard all sorts of rumours about the trail, including that there was a huge hill and a trail overlooking a cliff on the course! I was a little nervous to say the least. 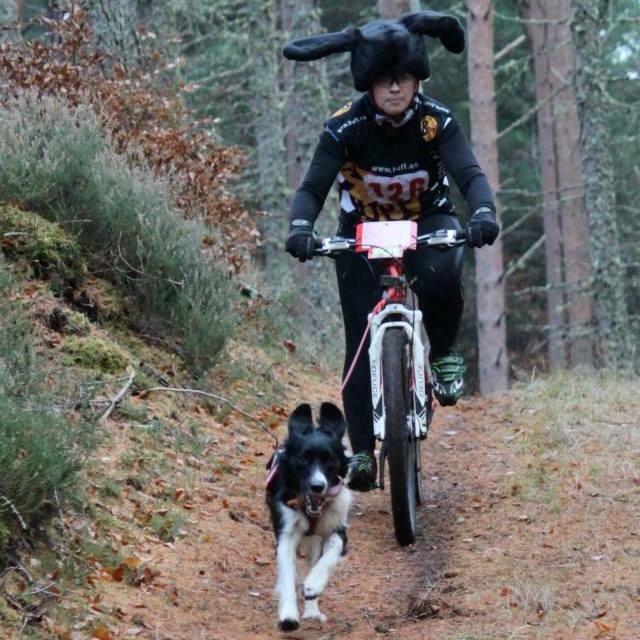 To try and squash the nerves and also to add a bit of fun to racing we had bought animal ears to put over our bike helmets and so the other racers were treated to the sight of a black bunny and my friend had a panda, bikejoring through the forest over the weekend. The course itself was fantastic, all under the cover of the trees and on wide, grass and pine needle covered, hardpacked trails. The first mile and a half ran mainly downhill with wide sweeping sections which made for some very quick racing. Not having ridden the course before I was cautious, especially with the rumours of the cliff flying about and I have to admit I took it quite steady on the first day, preferring to get around without incident. I found the big hill that was mentioned after about the 2 mile mark and it was a killer! Donnie and I both had to work hard to get up it and in the end I jumped off to make it easier. At the top of the hill I discovered the ‘cliff’ that I’d also heard about, where the trail ran along the top of a steep valley and this was probably the best section on the course, requiring concentration and skill to negotiate the turns without ending up sliding down the bank. I don’t know how those running the bigger teams managed to keep their nerve, as I was struggling on the bike. The last part of the course was undulating into the finish chute and took a last push to keep up any kind of speed after the mainly downhill stretch along the top of the valley. We finished in a reasonable time and I was happy we’d completed the trail without incident but knew we had to make up some time on Sunday and could push myself and Donnie a bit more now I knew what to expect. Sunday morning’s racing started half an hour earlier and it was great to be able to go along and watch some of the bigger teams start and finish before our own race. I really enjoy seeing the 8 and 6 dog teams go out and would love the opportunity to run a bigger team at some point just to experience the thrill it must be to take them around a course like this. Our Sunday race was a minute and a half quicker than Saturday because I had more confidence in the turns now I knew where we were going and I was able to push harder and take more risks. I had the back end of the bike sliding out from under me on more than one occasion but Donnie attacked the course with so much enthusiasm, I didn’t want to let him down. I even managed to cycle the full length up the hill which no doubt saved us quite a bit of time. We finished the weekend in 7th place in the bikejor class, 4th female and 2nd in my age category. My friend took a podium place being placed 2nd female and 1st in our age category, which means that she should now qualify to represent the UK for the IFSS Championships in 2014/2015, so it was a worthwhile trip and we came away with great results from a world class race. I would highly recommend this course (SDAS regularly organise races here as part of their race series) and am looking forward to the next IFSS Qualifier in February, if it’s anywhere near as organised and enjoyable as this one was, then we will have another great weekend racing! 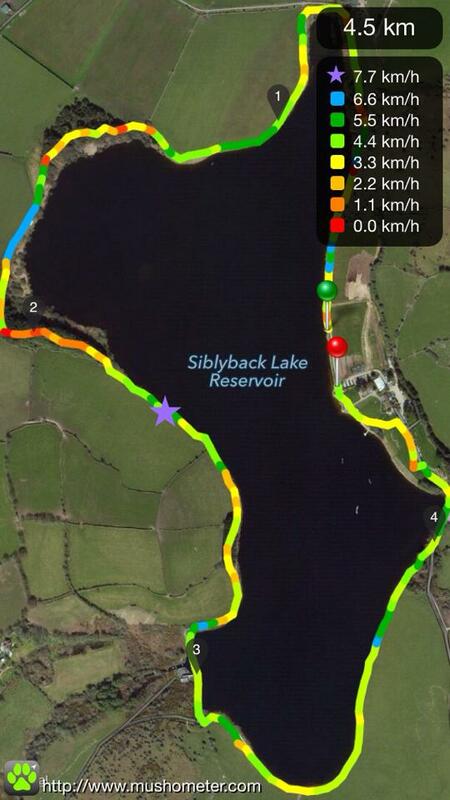 The first race organised by the Canicross Cornwall group was held at the venue of Siblyback Lake, which is on the edge of Bodmin Moor near Liskeard. 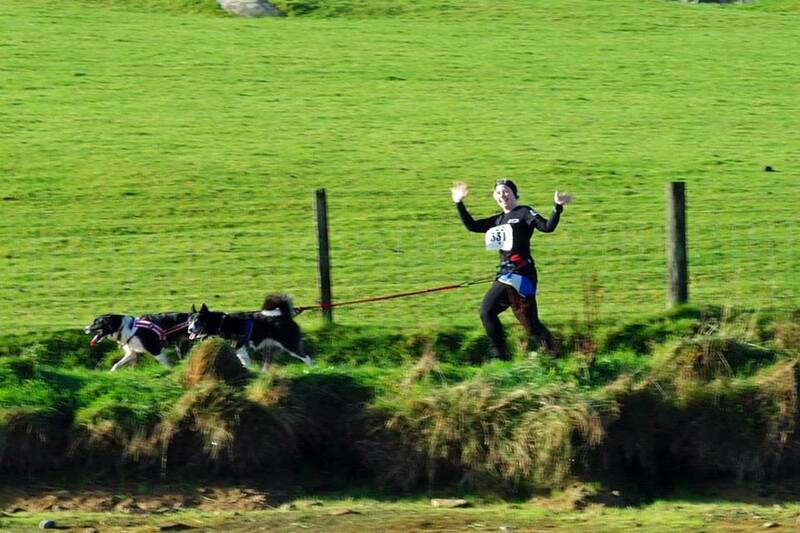 This was not a local race for us but turned out to be well worth the trip down to Cornwall, as Siblyback Lake was almost made to be a canicross race venue. We arrived early afternoon at the site to set up on the small but perfectly formed campsite on the edge of the lake. The facilities at Siblyback are second to none, with plentiful hot, clean showers, a superb little cafe and dry room for getting your wet kit dry again (the main activities here are watersports). We used an hour or so to explore the course, which was basically a lap of the lake on the hard packed trail but was surprisingly varied with couple of bridges to cross, some wooded twisty sections and some long flat straights to pick up some speed on. Saturday morning started off bright and breezy with good temperatures for the dogs to run in and then just as the first canicross racers were collecting on the start line, the heavens opened and the rain that we encountered was like nothing I’ve ever raced in before! I ran the first two miles laughing so much that it was a wonder I could run, the rain was coming down so hard across the lake, powered by the wind, that I couldn’t even open my eyes properly on some of the exposed sections. The wooded parts of the course offered some protection and by the end of my race the rain had stopped and the sun was coming back out again. I managed to get around the course in a reasonable time for me, considering my ankle injury, and I was pleased to be in third place for the female two dog class and tenth female. After a particularly unsettled and stormy night, (although we did have the exclusive use of one of the cosy function rooms at the venue for cake and wine!) we did it all again on the Sunday and the conditions couldn’t have been more different. With the sun shining, the competitors made their way around the lake, many mini-competitions taking place within the categories, as we had all been seeded for the Sunday starts. We managed to knock nearly a minute off our Saturday time and keep our third place, winning a trophy bowl, Non-stop collar and some dog food for our efforts. 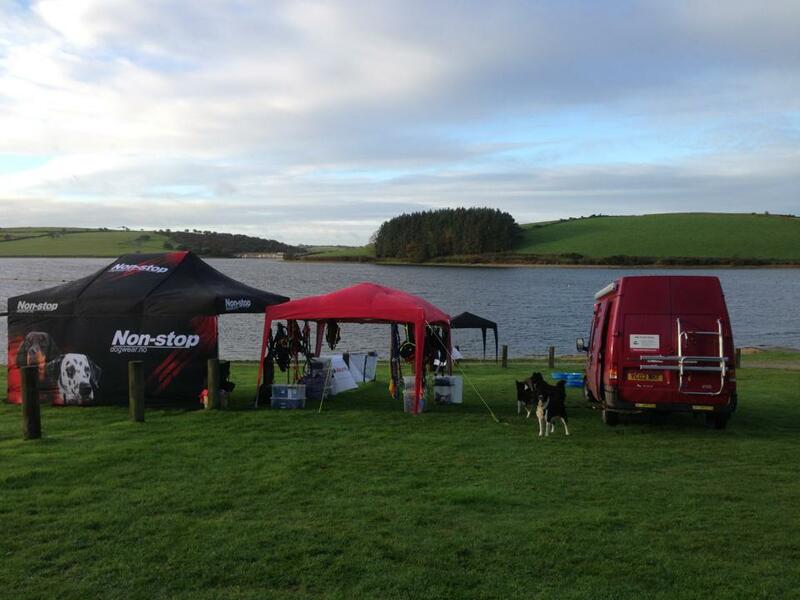 As this was the first event organised by Canicross Cornwall (http://canicrosscornwall.com/) I have to say I was hugely impressed by the competition and am looking forward to the next one, especially as the venue manager gave his permission after seeing us canicross race, for a bikejor and scooter class too. When the next Canicross Cornwall event takes places I will be there, the course was great, the organisation was fantastic and the only thing I would have improved was the weather, so here’s hoping next time it will be kinder to us on both days! In the second of my blogs on beginning bikejor, I thought I would focus on tips for training your dog for bikejor. Of course you may find your dog just doesn’t take to it and this is never guaranteed but usually if your dog enjoys running with you, they will also enjoy the freedom of running in front of you with the bike too. Voice commands – These are a must on the bike. If you can put in good groundwork teaching the voice commands with canicross or even just by using them on walks, then your life will be made much easier when you get on a bike. You will not have the same control on a bike as on the ground, where you can pick up the line to pull your dog the correct way or away from danger. The very basics are ‘left’, ‘right’, ‘straight on’ and ‘steady’. I use ‘gee’ and ‘haw’ for right and left but whatever works for you and your dog is fine. I also use ‘leave’, ‘on by’ and ‘hike on’ or ‘go’ as additional commands but to be honest it is more important to be able to direct your dog and stop your dog than anything else on a bike. Getting a pull out front – With bikejor you ideally want your dog to pull out in front of you rather than off to the side and definitely not behind! Some dogs may not want to be out front initially, as it requires the dog to have a lot of confidence in you to guide your dog in the right direction. I’ve found that by pairing an inexperienced dog with a more experienced dog to begin with (therefore giving them another dog to run with) is probably the best and quickest way for a novice to discover what is expected of them. So many times I’ve seen dogs running together who form up in a line shoulder to shoulder because it seems to be what comes naturally to them. The other thing you can do to encourage a dog to pull out front is to give them something (or someone) to chase. Another dog attached to another bike or even just another person on a bike out in front calling and encouraging them can make a real difference to a dogs’ confidence in knowing that you want them to run forward. I have used both methods with great success in getting dogs comfortable with being attached to the bike. 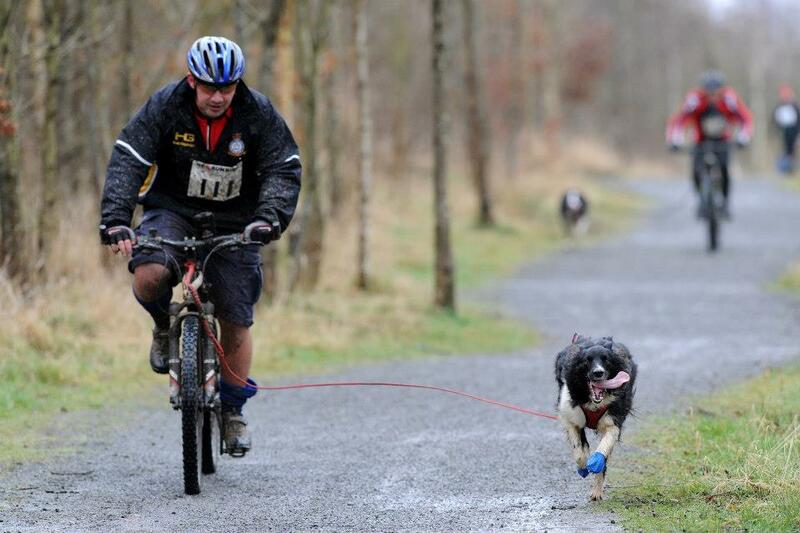 Problem solving – You will no doubt encounter some issues when you first start training your dog for bikejor. I had an issue with one of my dogs dropping back every time I braked because my brakes tended to squeak when I did and she would look around, unhappy with the noise and not confident I wasn’t about to mow her down! If your dog is unsure, make sure you take small steps with training. Keep it simple and fun so that your dog is not being expected to run too far or too fast until they are happy with what you are doing. This might mean only doing very short distances of a few hundred metres to begin with but if you get the basics right your dog should quickly want to do more and will let you know when they are ready to do more. You will also get dogs who will try to go much further and faster than they should at first and it is down to you to be sensible and not allow them to be over stretched. One of my dogs would run until he dropped if I let him, so I carefully monitor his action and if I can see he’s getting tired then we have a break. 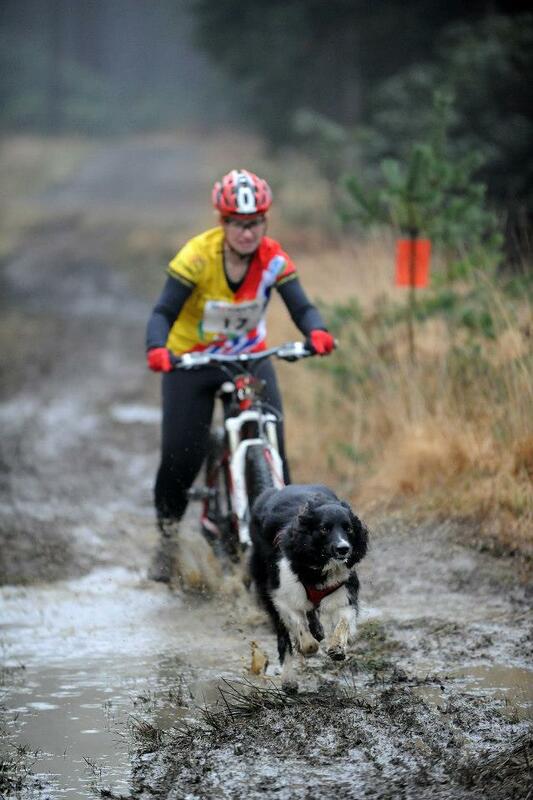 I also carry water on the bike as I personally wouldn’t leave home for any training session without water for the dogs. There are also the dogs who want to stop and sniff at everything, for those dogs I would employ the methods above for getting a dog to pull out front. As with all training it is always better to make the action you want your dog to perform seem like more fun and rewarding than the activity they are participating in to avoid the one you want. As with all dog sports be mindful of the terrain and temperature (as I have mentioned in previous blogs) and also check where you are allowed to train with your dogs with the bike. It may be you need a permit or other permission to use the land and it is always better to check locally to find out. 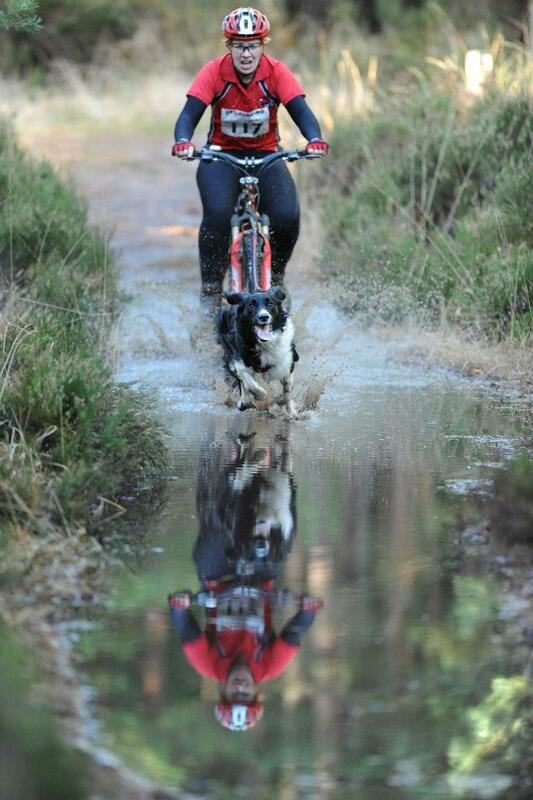 Most of all make sure it’s fun for both you and your dog, bikejor shouldn’t be scary or dangerous if you stick to a sensible training plan and always expect the unexpected! 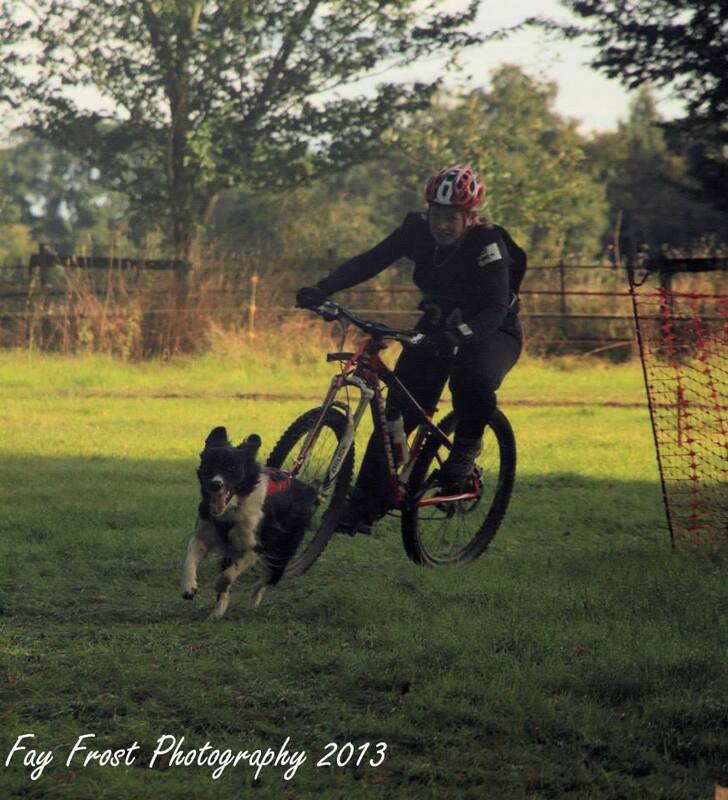 With more and more people in the UK beginning to recognise the fun you can have mountain biking with your dog, I thought I’d write a short blog with the top things you’ll need when starting out bikejoring. The bike – Although any old bike will do to begin with, it is worth having something with good brakes and front suspension. You are likely to be encountering lots of bumpy ground and obstacles which you will need to brake for, so the comfort of suspension and safety of good brakes are a requirement. The harness – Your dog will need a good fitting harness and whilst it has been debated many times what type of harness is best for bikejor, it is my opinion that if your dog is comfortable in the harness and it can still work properly with the higher point of attachment that you get from a bike, then you can use a harness for all the dog sports (canicross, bikejor and dog scootering). 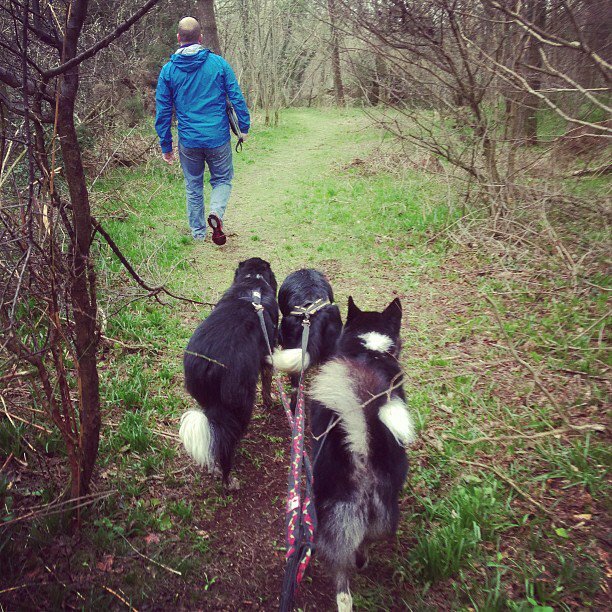 If you need any advice on this feel free to get in touch – emilyt@k9trailtime.com. 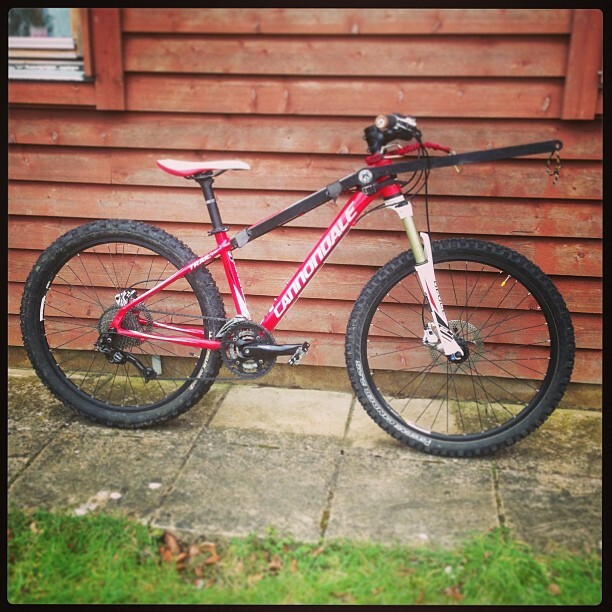 The line – Must have bungee in it and be long enough to ensure your dog is not restricted and too close to your bikes’ front wheel. On the flip side of that, if your dog is likely to stop and sniff, then a longer line will drop more and may result in getting tangled in the front wheel. You need to decide if your dog is likely to stay out front or drop back and choose a length to suit your individual set up. The safety equipment – Never go bikejoring without a helmet and gloves on. Even if you are the most competent of bikers and your dog is impeccably behaved, you can’t predict every environmental factor you will encounter therefore it is always better to be prepared for the worst!